In Chania, there are traditional Cretan clubs with local musicians playing the lyre and lute and violin and offer you the chance to live life like the locals and have the time of your life the... true Cretan way! Covering all kind of tastes, the area of Chania offers you anything you can think of from seaside cafes that give you the chance to relax and unwind to bars and clubs playing all types of music from jazz and pop to Greek music, depending on the time and mood. The area of Chania offers something to every traveler when it comes to the kind of entertainment that is offered to you so you do not have to worry about whether you will enjoy yourself during your holidays. With no doubt the center of Chania is the busiest part of the island especially during the hot summer months, attracting visitors from all over the globe. During the summer months that visitors are floating you will discover that the city of Chania has a more cosmopolitan atmosphere with so many night clubs and seaside bars that if you are a party lover it would be so hard for you to find your return boarding pass! In Chania you will fall in love with Cretan cuisine and- lets face it- you will love raki, and also the Cretan version of Greek salad, ntakos, and so many more delicacies! You may definitely find so many restaurants serving more international tastes but be sure to try the area’s local products. Try kefalotiri cheese, homemade tirokafteri, sweet cheese pie sweets called kaltsounia and so much more. 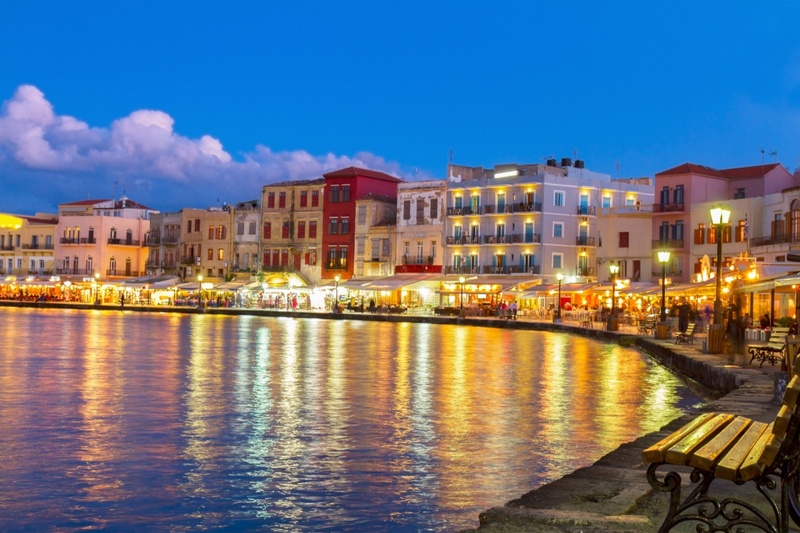 In the Old Town of Chania you will find a wide variety of restaurants and taverns to satisfy your appetite. If you are nightlife lover then you will find from Scandinavian Bars to American Bars and English pubs and clubs as well as many beach bars by the sea that will make your nights unforgettable. In Agia Marina and Platanias you will feel the vibe of the area beating hard as this is the heart of the nightlife in Chania! Have your coffee or walk along the seafront or even choose to see a film in one of the summer outdoor cinemas and enjoy the fresh air. In Chania you will see so many theater groups and evening festivals held in the villages or the main city and you will feel the vibe of this amazing part of Crete island taking over you!